Buy 1 litre of Volvic naturelle water and they (Volvic) will pay the equivalent of 10 litres in form of financial aid to UNICEF – who are said to be drilling boreholes in the Amhara region of Ethiopia. What a perfect way to improve your public image. Nothing new though, the project has been up and running since 2005 now, and there’s a credible (German) journalist doing his “research” on the ground to see every donation is properly used. People in Europe WANT to help other – poorer – people and they want this aid to arrive as a 100% sum. Obviously, it’s a noble idea. See that screenshot above? 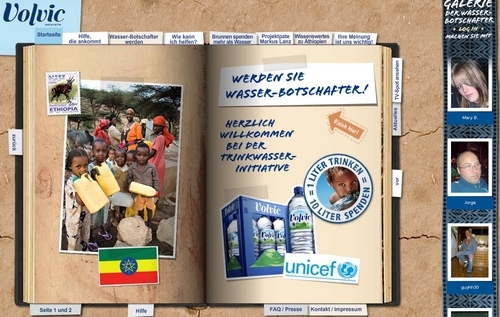 It comes from the Volvic fuer Unicef website and informs visitors about recent activities, tells them where Ethiopia is, which region will benefit and even – and that’s a bit strange, I think – provides us with a gallery of donors that have already logged in on that site and donated for this cause. Now, those 92 boreholes/wells may not be such a huge figure to the groundwater discharge problem, but as far as I am informed, “water is in abundant supply on the world’s poorest continent” and “poorly managed”. Poorly managed, oh yes indeed. a) the usage of a mismanaged, but proud and rich country like Ethiopia to highlight some burning Millenium Developement Goals? b) private companies trying to raise their sales & creating a positive product image by donating a certain amount for an x quantity of sold goods? c) consumer’s desires to share their relative wealth with other, less fortunate people on this planet in a politically correct way? As for me, I am bit undecided. It always freaks me out when I see this kind of advertisement (Africa = poor = help needed) – as already seen the other day. Even IF we share 1 Euro/pp with another nation of our choice – will things improve? And is it only a matter of financial aid? What about poor management? What about those young academics who are educated abroad and then have to settle for a 300,- EUR/month job with a governmental institution once they come back? Are they going to be the Cheetah generation? Or are they rather going to stick to the rules and manage to climb the institutional job ladder in order to support their families and continue managing the mismanagement they’ve inherited from the retiring Hippos? I think that Ethiopia does not really need this help. Sure, it’s a nice gift and comes for free + provides further income, but is this the way to help? I feel thats the not right way to help. Andrew Mwenda, a ugandan journalist, pretty much has alot of answers to some of these issues, but I assume you read his opinion, jke. Whats yours? Other than that; Volvic seems to be mimicking Krombacher (German Beer Brewery) and their corporate social responsibility- action plan, and guess what: In my opinion they don’t give a sheep about development aid. It’s all about accumulating sales through image-branding CSR-events (would they do such markting during european winters? I doubt it). They do NOT see, that creating financial incentives for Microsoft in order to start investing e.g. in Uganda would be the solution to reducing poverty. Sebastian, thx, hadn’t seen this article/interview with Mwenda. Interesting. My opinion? Somewhere in between a mixture of Zed’s opinion on this (marketing approach) and Shikwati / Mwenda ‘s position on dev aid – and this although I am working right in the middle of one huge donor org. Talking about changing a system from within…. And also, as much as I appreciate private initiatives (=> Volvic), I wonder how this will destabilize any governmental institutions and (political) approaches. Dev aid is a business. And so is selling water.